We bring you last week's top former Chargers players who are currently playing in pro basketball. #1. 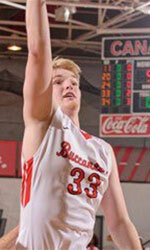 Eric Anderson (6'9''-F/C-93, graduated '15, plays pro in Argentina) led Obras Basket to a victory over one of league's weakest teams Argentino (1-6) 90-81 in the Argentinian La Liga in Monday night's game. He was MVP of the game. Anderson scored 23 points, grabbed 9 rebounds and made 2 blocks in 30 minutes. 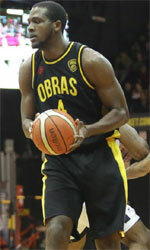 Obras Basket Buenos Aires (7-2) is placed second in the La Liga. It was his team's sixth consecutive victory in a row. But this is still an early stage of the season and everything may happen. It's Anderson's first year with the team. He has relatively good stats this season 13.1ppg, 8.9rpg and 1.1bpg in nine games he played so far. #2. 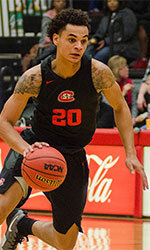 Jeremy Williams (6'1''-G-91, graduated '13, plays in Denmark) contributed to Naestved's victory against the leader EBAA (8-1) 87-75 in the Danish BasketLigaen last Wednesday. Williams recorded 10 points. It was his first game for Naestved this season. It was the game of the round between two top 3 ranked teams in group ProA. His team is placed third. It was Naestved's third consecutive victory in a row. Williams is a naturalized Liberian. Worth to mention he played also at Eurobasket Summer League, which helped him get the job in pro basketball. #3. Danny Upchurch (6'0''-PG-94, graduated '18, currently in Georgia), who plays in the Georgian Superleague could not help BC Titebi (3-5) to beat Delta (5-3). Upchurch scored 8 points and added 4 assists in 27 minutes. BC Titebi was badly defeated 90-72 in a derby game by the higher-ranked (#4) Delta. Upchurch has relatively good stats this year 12.4ppg, 3.4rpg and 5.3apg in eight games. #4. Joshua Guddemi (6'7''-F-94, graduated '16, plays pro in Germany) was not able to help HAKRO Merlins II (5-10) in their last game on Saturday. Despite Guddemi's good performance the 12th-placed HAKRO Merlins II (5-10) was edged 70-68 at home by the higher-ranked Mannheim (#11) in the South-West group. He was the top scorer with 14 points. It's Guddemi's first season with the team. Guddemi has relatively good stats this year 13.0ppg, 8.0rpg and 1.3apg. Notice: The list above includes only some of the New Haven University alumni playing currently in pro basketball. Check COMPLETE LIST.